Especially as yesterday's Vatican move to nix the US bishops' votes on several crisis-spurred reforms had the effect of detonating an ecclesial bomb of confusion and outrage, this Tuesday's latest salvo from Rome is all the more significant: six years since "The Most Dangerous Man in the Vatican" was quietly slipped out of town, Archbishop Charles Scicluna is coming home to the "Holy Office." At Roman Noon, the Pope named the 59 year-old Maltese (above right) as adjunct secretary of the Congregation for the Doctrine of the Faith – a second #3 official, joining the Bronx-born Archbishop Gus DiNoia OP, another Ratzinger favorite alongside whom Scicluna worked closely during his first CDF tour. 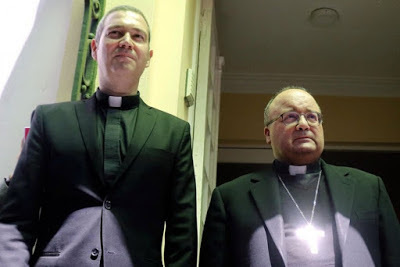 In a unique arrangement not seen for the Curia in a half-century, however, the announcement added that Scicluna "will remain archbishop of Malta," where he was recently given an auxiliary to help balance his already increased Roman workload. Having spent over a decade at CDF as promoter of justice – the lead prosecutor who oversaw the removal of some 3,000 abusive clerics worldwide once the congregation wrested competence for the cases in 2001 – Scicluna's star has risen even further over the last year after the archbishop led Francis' probe of the roiled Chilean church, whose damning findings saw the country's bishops submit their resignations as a bloc during a May summons to Rome. To date, the Pope has removed seven of Chile's diocesan bishops – a quarter of that bench – from office, with more in process. Coming in tandem with the Holy See's last-minute "insistence" for the USCCB to delay this week's planned approvals of a new code of conduct for bishops and investigations of accused prelates, today's move further highlights the critical significance of February's summit in Rome for the presidents of the global church's episcopal conferences – the Vatican's first-ever worldwide gathering on the abuse crisis. During a briefing at last month's Synod that quickly became dominated by questions over the scandals and Francis' handling of the storm, Scicluna pleaded for doubters of the pontiff to "give him time," underscoring with it his sense that the winter meeting would produce concrete outcomes on the accountability of bishops. In light of today's move, the latter result suddenly seems all the more bankable, let alone the potential for global norms addressing those cases (e.g. prelates involved in cover-ups or other abuses of power) not treated in existing law. As he's retaining his diocese – and with it, the presidency of Malta's three-man bishops' conference – Scicluna notably remains an ex officio delegate to the February talks, a role he wouldn't have were he moving full-time to the new post.